The following pages have been written with two distinct aims in view. In the first place, it has been my endeavour to treat my subject in such a vein as to render the text interesting to those who may wish to acquire sufficiently accurate knowledge of old English and some French furniture in order that they may be able to distinguish one style from another, to apportion each to its proper period, and to learn something of the history of all, without entering upon a very deep study of the questions involved. For inquirers of this class, I trust that my general remarks in each chapter will afford the necessary information. For the non-technical reader, therefore, I have striven to connect the various styles with great political and social changes, so as to impress them the more clearly upon their minds; at the same time an effort has been made to refresh the memory respecting those leaders in art and literature of different ages, whose names are venerated by all, and who, in their day, were unquestionably surrounded in their home life by such household gods as those depicted. By adopting this course, I have hoped to enable those who follow my thoughts to people with familiar friends the interiors which they will furnish in imagination from the store of examples set at their disposal. Though those friends have long since entered into "the great unknowable/' we cannot help sometimes fancying that they are still with us in the flesh, holding friendly converse in our midst. I have attempted also to demonstrate the fact that domestic furnishing, and particularly that of the past, may really be regarded as an outward and visible expression of the spirit underlying all national life ; how far success has attended my efforts in that direction must be left for others to decide. The requirements of the genuine student are far too exacting to be satisfied with mere generalisation, and they, of course, have had to be borne constantly in mind. That being so, I have, so far as considerations of space have permitted, traced the immediate origin of each style; followed its development; analysed it; instituted all essential comparisons between one style and another; classified characteristics ; recorded the names, and, in some cases, briefly sketched the careers of leading designers and makers; and, as far as lay within my power, have discussed at length every point of importance connected with the subject. 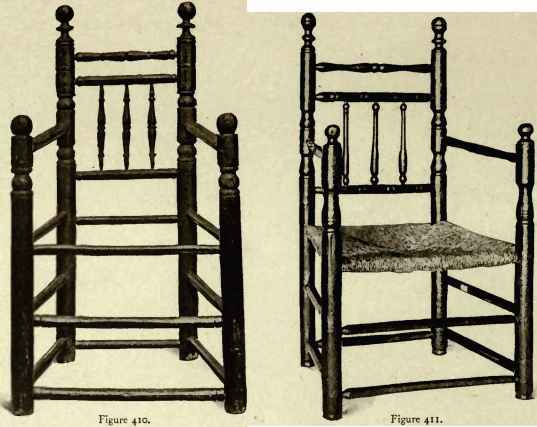 If any reader, therefore, has to decide the question whether a chair be Jacobean " or " Queen-Anne "; whether ali cabriole " be French or " Chippendale " ; to distinguish between a ° Heppelwhite" and a u Sheraton " tracery; to account conclusively for the character of any style; or to solve any other of the numerous problems which are constantly being encountered by the professional worker, I sincerely trust that material assistance will be afforded by these pages. If anyone derive from the perusal of this work one-thousandth part of the pleasure that has been associated with its preparation, my labours will not have been in vain. duce a number of illustrations from the pen of Mr. Baldock, which have appeared in the pages of that journal, but which, as it is a publication strictly confined to trade circles, have not come under the eye of the public. 4 Vicarage Mansions, West Green, London, N.